I promised you all a great side dish recipe, and I never go back on my word. I was very excited when I came up with the idea for a cheesy polenta , and even more excited when the execution was as savory as I had hoped. The dish is only five ingredients and takes less than 10 minutes to do- perfect for prepping while your meat is resting. This uses ready-cooked polenta, which is my only option around these parts. As much as it pains me to admit it, it doesn’t make THAT much of a difference- provided you can get past the initially off-putting look and texture. We had this for dinner, along with the Pesto Pork Tenderloin for dinner one night before Dave left for work. When he got home in the morning, he asked me if there was any more of it left. I told him yes, enough for one person, and to be sure to add some milk when he warmed it up so that it was creamy. He ate it and went to bed. After he got up, he made a point to tell me that it hit the spot, put him right to sleep, and he thought it was even better the next day. This is a really great side dish to accompany all those grilled dishes are doing the summer. The smoky flavor of the cheese goes really well with the charred taste from the grill. 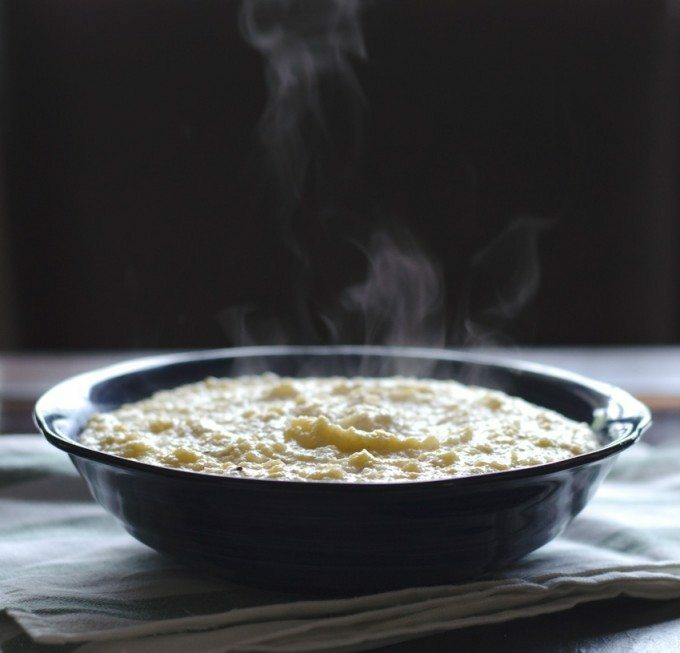 Think a rich macaroni and cheese meets grits, and you’ve got the basic premise of this dish. 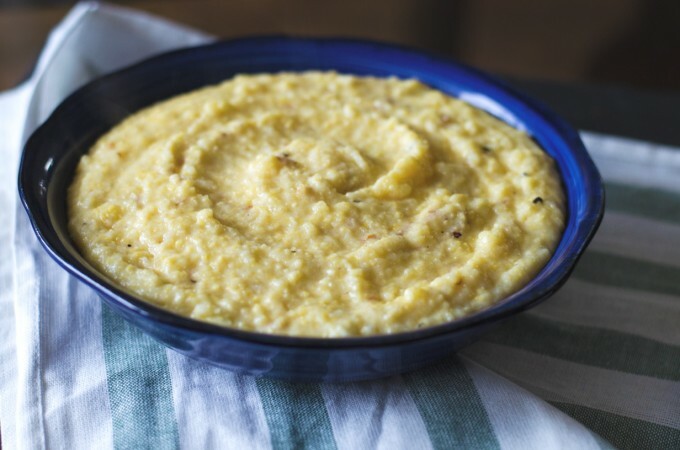 In a large saucepan over medium heat, add the polenta, breaking it up as much as possible using a potato masher, wooden spoon, or whisk. Pour in the milk and bring the mixture to a simmer. Whisk occasionally, until the polenta and milk have come together and are totally smooth. Add in ⅓ of the cheese and stir until totally melted and combined. Repeat twice to incorporate the rest of the cheese. Remove from the heat. Season with the pepper and stir in the butter. Add more milk if the mixture is too thick after sitting for a few minutes, and serve. 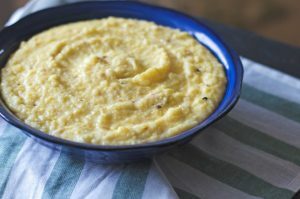 I have made cheesy polenta once in my life! It wasn’t half as good as this one sounds. That smokey gouda is everything! Pinning so I can try this soon! I can’t wait to make it again myself! Thanks Jen! 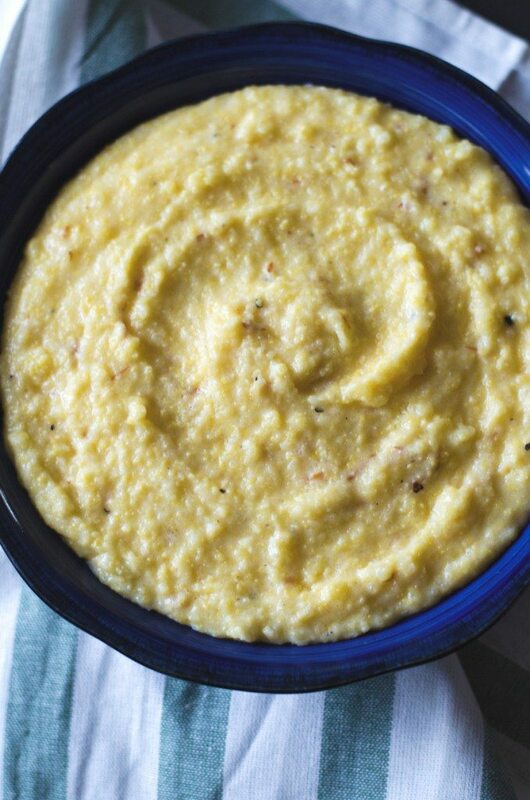 So polenta is my favorite food…and gouda is a favorite cheese….so this is pretty much my heaven! Love the rusticness of the picture! Tonight was my first time cooking polenta ( promise I don’t live under a rock). 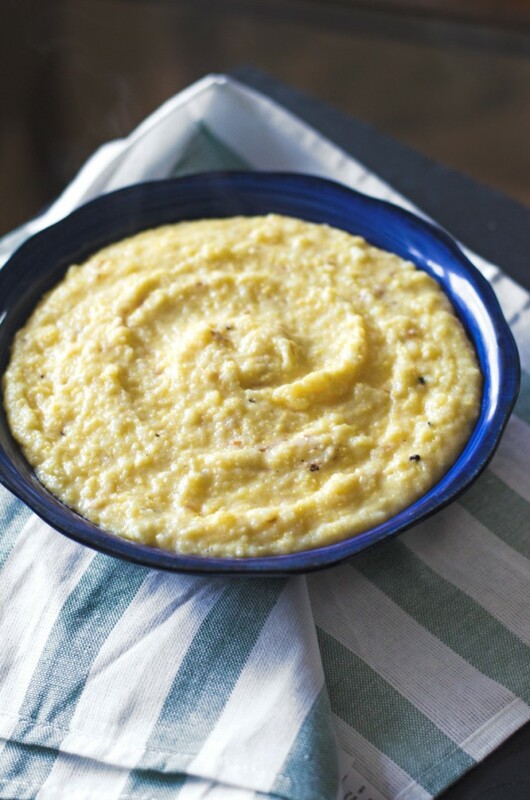 Luckily we have quick cooking polenta available here. I thought I had smoked gouda however, it just was not. But that didn’t stop me from dumping a bunch of parmesan in there too. I’m thinking the leftovers may deserve a nice fried or poached egg in the morning. Thanks for the recipe. Sorry this is a dumb question, but do I spray my pan before cooking the polenta? I’m making this for Christmas dinner and want it to come out perfect! Thanks!